‘Sore calves’ everytime you run or play sport? Calf pain when running Part 1. Do you suffer with ‘sore calves’ everytime you run or play sport? The biggest predictor of injury is a previous calf strain, and age. Previous calf strain would probably suggest something is wrong so lets look at what we can do. Age- well your only as old as you feel right? Could it be the way you run? We call it calf dominance, and its obvious in people with a very bouncy type gait. The calves will generally push you more vertical where the hamstrings will drive you forward (you need the vertical movement from the calves to clear the ground). The glute max does both – forward and vertical so it is important to ‘engage’ it/them as best you can to reduce the forces and reliance placed on the calves. We can help with gait re training and its probably our favourite thing to do. Word of warning regarding the research though… there is some evidence to suggest it can be changed, and some against. Theres also evidence that changing the way you run can engage the right muscles, but then it may engage the wrong ones too. We beleive we do it well and we use Exercise Physiologists and Physiotherapist to assist us with engaging the right muscles should you not be able to be ‘prompted’ into good habits, or out of your bad habits. There are some normal values that we look for in regards to ankle range. Knee-to-wall and tibial angle are 2. We don’t like the term ‘normal’ too much so we use these measurements as a guide. For example: way under the ‘normal’ range (not much ankle movement) and you would expect the calf to be loaded quickly and for short period of time. This can fatigue it quicker and place a great deal of stress on the calf complex. Things such as heel raises and softer shoes may help reduce the impact and rapid loading allowing symptoms to take longer to present or settle completely. Should the ankle range be way off the scale (a lot of ankle movement) then heel raises and softer shoes can be detrimental to calf function, so it is a good measurement to be aware of. Shoes that are too tight in the forefoot- not allowing you to raise onto your toes restrict the joint behind the big toe. This is a crucial joint for forward propulsion, and if it is restricted (think soccer/football boots/shoes that are too small) this means that you have to bend somewhere else to compensate. Lets say the knee bends and the ankle moves more to compensate. The gastrocnemius (the top calf) is no longer loaded as much is it should be, therfore the lower calf becomes overloaded and calf pain presents quickly. The information above is a guide for people suffering calf pain when running. There are many reasons for calf pain including some that include loss of blood flow. Please take as general information only and if you are suffering with severe calf pain, particularly after walking short distances please have it checked out, especially if you have vascular disease or diabetes in your family. 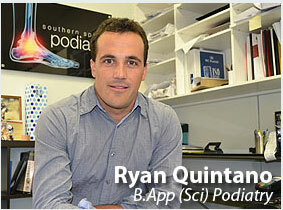 Call us on 02 9521 7578 to book a thorough biomechanical assessment & sort out your calf pain!